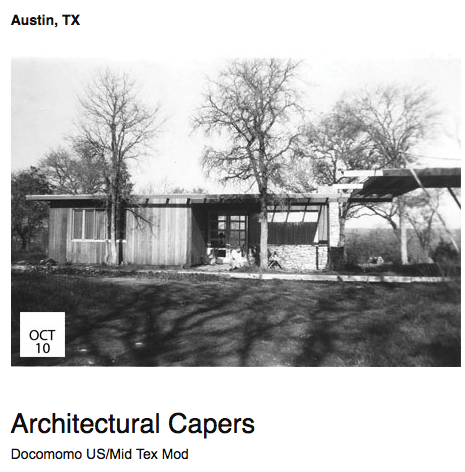 This Oct 10th is the National Tour day for Docomomo. Local conservation group Mid Tex Mod has help put together a home tour this year featuring the homes of A.D. Stenger. In addition there will be a lecture by local architect and Stenger historian Riley Triggs. Definitely a not-to-be-missed event for any Stenger fan. More details and info below. Described by his contemporaries as a maverick, an innovator, and bull-headed, A.D. Stenger was a larger-than-life character and Austin’s most prominent designer of mid-century modern homes. Building houses for creative middle class clients, Stenger took on the role of developer, architect and builder to create homes with modern sensibilities and a "homey comfort" that were a response to demand for affordable modern design. Stenger homes feature many of the hallmarks of mid-century design, along with idiosyncratic features that allow his designs to connect with –yet soar above– the often hilly, topographically challenging Austin landscape. Architectural Capers will feature a lecture on Stenger and his work, followed by self-guided tours of Stenger homes.